She went away and came to the west coast…Then she jumped into the water in front of her. He did not know that he had married a female killer whale that had been born of a woman. 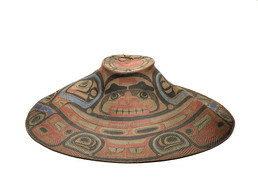 This woven spruce-root hat is painted with abstract form-lines representing the Killer Whale, a crest owned by all of the Raven moiety clans. In traditional stories, killer whales are the rulers of the ocean; they are fearsome creatures that break canoes and drown the people inside, who then become whales themselves. Leading men and women wore hats with painted clan designs at ceremonial occasions such as the great house-building feasts. This hat from Masset, British Columbia has leather chin straps and a wooden frame inside to support the crown.